Our hands and feet need pampering just like our body needs. They are the most hardworking limbs of our body. So how can we forget them? They too need our special care and love. This care for our hands and feet is called manicure and pedicure respectively. These treatments at a proper salon needs a lot of money and is also time consuming. If you don’t have time and want to save some money, do your own manicure and pedicure at home. Its not a very difficult job, but only gets better with practice. But before that you need to know the right manicure and pedicure tools needed to pamper yourself with a salon-like touch. This is used to trim long nails to an even length and shape. This gives nails a proper shape. It is not a very good option to use a metal nail filer as it does not even out the corners of our nails. You may find an emery board which has a coarse and fine side. The coarse side shapes the nails and the fine side smooths them out. It polishes the surface of the nails giving it a consistent and shiny look. Use it for loosening and pushing back the cuticles and is usually metal with one of the tips resembling that of flat head screwdriver. The spoon edge of the cuticle pusher is used to loosen the cuticles by gently working on them while moist. The flat edged side of the cuticle pusher is used to push cuticles back and to remove dead cuticle that may adhere to the nail. This is used to trim the hangnails and dead skin. Use this with caution otherwise you may end up hurting your fingers. Use this after the cuticle tools to clean your nail surface and under in warm soapy water and get rid of nail dirt. This is exclusively used for pedicure to smoothen out rough heels. It exfoliates the dead cells from the feet soles and helps in softening the calluses. This is multifunctional. It can be used to push back cuticles or clean dirt under your nails or even to correct nail paint errors. Place these in between your toes before putting on nail polish so that they do not smudge. There are also some other products which are needed to give a perfect finish. Soak your hands and feet for a little while to soften your nails and cuticles for a proper treatment. To remove the existing nail paint and prepare your nails for polishing. Use with nail polish remover or wrap it around the tip of your orangestick to push back cuticles. Prime your nails with a base coat for a long-lasting nail paint or nail art. It also prevents dark nail paints from staining and discolouring your nails. Some base coats also promote healthy nails. To even out and seal polish. It gives a shiny and glossy finish to your nails. To moisturise the nails and cuticles making it easy to work on. Pedicure and manicure is never complete without a good moisturizer or lotion. Take a sufficient amount and massage your hands and feet after scrubbing to soften skin. 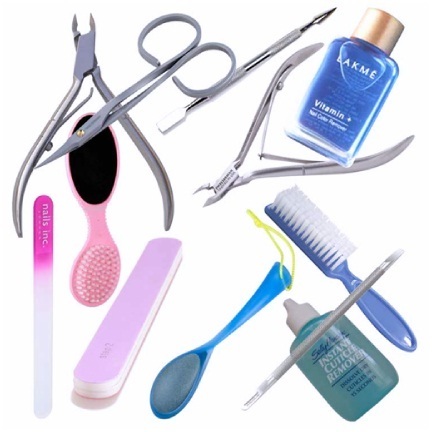 You may wonder what is the need to clean pedicure and manicure tools when it is only you using them? True, but it is always advisable to clean your used products making it clean and hygienic. The dirt and dead skin on these tools obviously has some adverse effects. They may result in the growth of bacteria and germs thus causing infection. Therefore cleaning them is very essential before and after each use. Keep your tools soaked on warm soapy water with some drops of disinfectant. This will kill all the germs keep your equipment bacteria-free and hygienic. It is also better if you do not share your pedicure and manicure tools with others and even do not use others equipment’s. Important Note***: One thing that you need to keep in mind when you go to spas is that you need to avoid elite fish pedicures as they have been claimed to be causing infections and is now being banned in lot of countries.